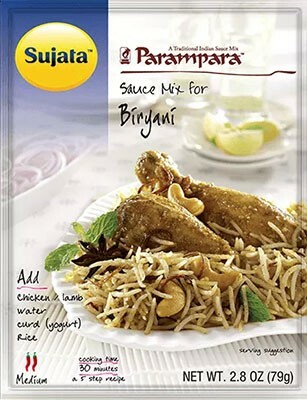 Buy Parampara brand Spice Mixes here. Over 30 to choose from! 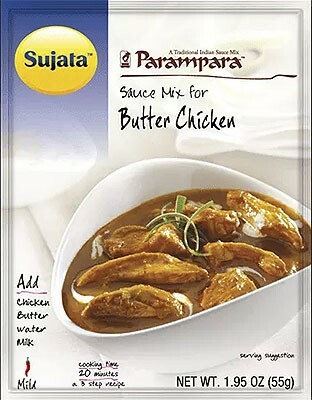 Choose from popular mixes like Parampara Butter Chicken Mix, Parampara Chicken Tikka Masala Mix and Many others! Meat is flavored with herbs, spices, and seasoning and cooked along with aromatic Basmati Rice to prepare one of India's finest foods, the "Biryani." Succulent biryani is ready in minutes with this spice pack, chicken/mutton, rice, salt, lemon juice, water, yogurt, ghee, milk, saffron or turmeric and the optional cashews and golden raisins. $1.89 Notification will be sent to your e-mail address every time the item price is decreased. Butter Chicken is the best known chicken preparation from Northern India. 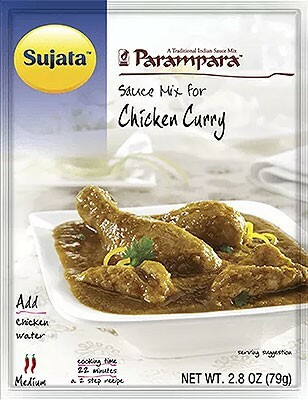 Chicken is served in a rich and creamy gravy, delicately flavored with nutmeg and saffron. This dish is mild and tastes best served with rotis or Pita bread. Butter Chicken is ready in minutes when this spice mixture is mixed with chicken and water. Can be prepared on stove top, with pressure cooker or in microwave. From North India, this chickpeas based tangy gravy is laced with tamarind and a hint of sugar. As you take a bite, you are sure to get transported to the land of the open green fields of Punjab. Mouth-watering Chhole is ready in minutes when you mix this spice mix with soaked chickpeas and water. Can be prepared on stove top, in microwave or in pressure cooker. A thin gravy-based Chicken preparation with hints of mint and coriander, as preferred all over India. 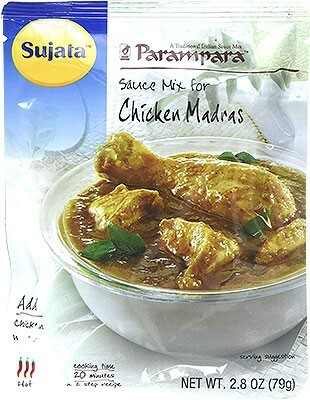 Make this mouth-watering dish by simply mixing the contents of this packet with chicken and water. Can be prepared on stove top, with pressure cooker or in microwave. A rich gravy curry dish made with aromatic spices and a hint of coconut...truly Madras! This ready to cook spice mix is super easy to use - simply add the contents of this pack with chicken and water and cook for 20 minutes! A deliciously thick yogurt, green chilli and coriander based gravy as preferred by the Persian rulers who established the Moghul rule in India. 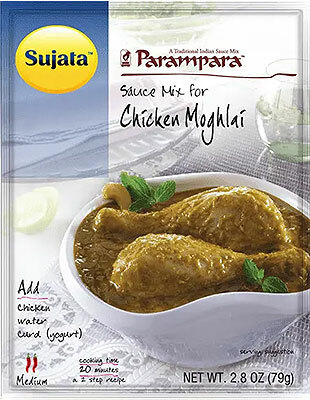 Chicken Moghlai ready in minutes when you mix the contents of this packet with chicken, water and curd (plain yogurt). Can be prepared on stove top, with pressure cooker or in microwave. 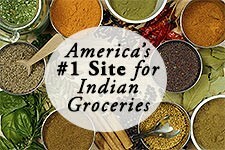 Loved around the world, Chicken Tikka Masala is one of the most popular South Asian dishes. Adapted by the British, it is a thick, yogurt based gravy with succulent pieces of boneless chicken. This mix is comprised of onion, sunflower oil, garlic, ginger, red chili powder, salt, tomato, spices, turmeric and lemon. 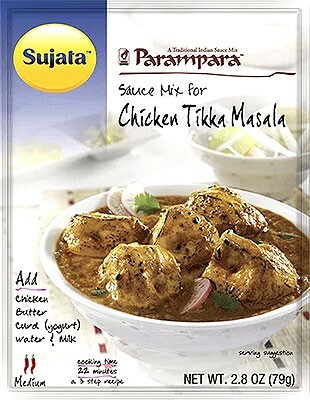 Preperation is quick and easy: Mix the contents of this pack with chicken, water and yogurt, cook and succulent Chicken Tikka Masala is ready! Can be prepared on the stove top or in a microwave. Serves 3. This classic rich and creamy lentil based curry from Punjab is truly a mouthwatering fare. It can be served with any Indian bread or rice. Just add whole black urad lentils, water, cream, ghee and onions. Egg lovers from all over the world have given a nod to this preparation. The thin gravy with a hint of mint has the perfect combination of herbs and spices. 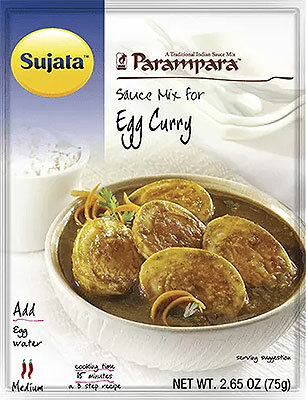 Egg Gravy is made simply by adding this spice mixture with eggs and water. Can be prepared on stove top, with pressure cooker or in microwave. Goa - known for it's beautiful beaches and wonderful cuisine brings you this unique fish preparation. The coconut base of this gravy makes the preparation mild and the wonderful assorted Indian spices make the preparation wildly tasty! 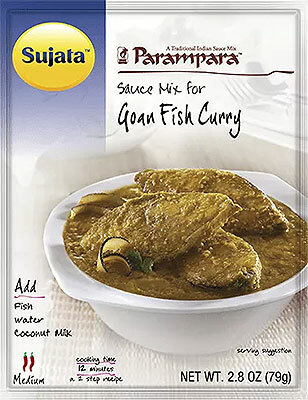 Make Goan Fish Curry tonight by adding the contents of this pack with fish, water and coconut milk. Nothing else is needed! Can be prepared on stove top or in a microwave. Serves 4. 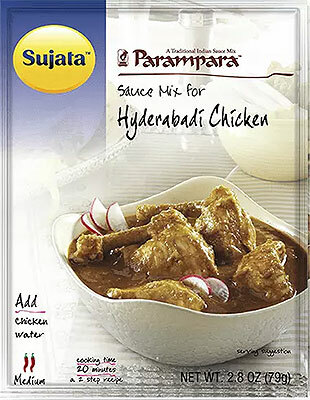 From Hyderabad in South India, Parampara Chicken Hyderabadi is a rich, palate tickling preparation, made with mostly whole spices to create a thick, aromatic gravy. 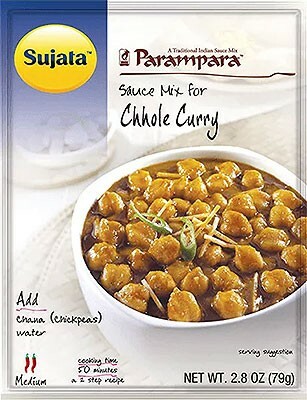 The lip-smacking dish is ready with just the contents of this pack, chicken and water. Can be prepared on stove top, in microwave or in pressure cooker. Ingredients: Ingredients: Dehydrated Onions, Sunflower Oil, Garlic, Coriander Leaves, Salt, Red Chilli Powder, Ginger, Dehydrated Tomato (Tomato solids, maltodextrin), Mint Leaves, Spices, Acetic Acid, BHA added to preserve freshness. Juicy and tender pieces of lamb, cooked in a palate tickling combination of herbs and spices blended perfectly in a thin curry. 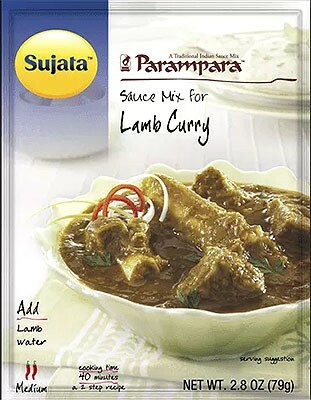 To make a succulent lamb curry simply add the contents of this pack with lamb and water and cook! Ingredients: Onion, Refined Vegetable Oil, Garlic, Ginger, Red Chilli Powder, Spices, Tomato, Coriander Leaves, Mint Leaves, Salt, Turmeric. 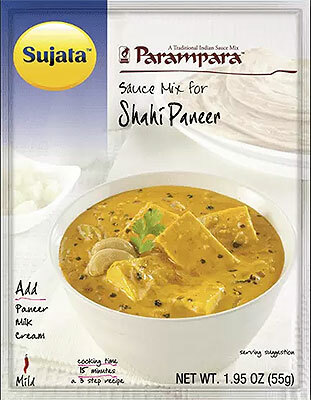 Paneer (Indian cheese) and green peas simmered in a rich and creamy gravy. Preparation is easy, all you need is this spice pack, paneer, green peas, water and plain yogurt (curd). This succulent dish can be ready in less than 20 minutes. This spice mix is comprised of onion, garlic, ginger, coriander leaves, tomato and other spices. 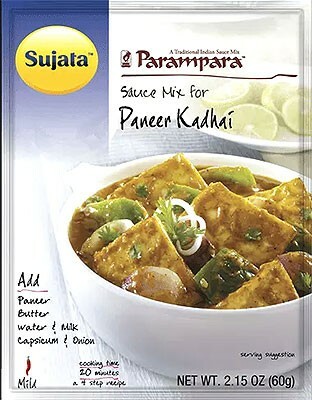 As the name suggests, fresh paneer cheese cubes intermingled with a thick gravy of green bell peppers (capsicum) and onion. 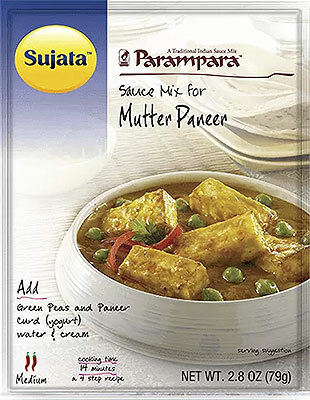 Make this wonderful dish by mixing this spice mix with paneer, peppers, onion, water and butter. Can be prepared on stove top or in microwave. This ready to use spice mix is used to make a savory shrimp in coconut milk curry. It is the preferred seafood dish in all the coastal regions of India. 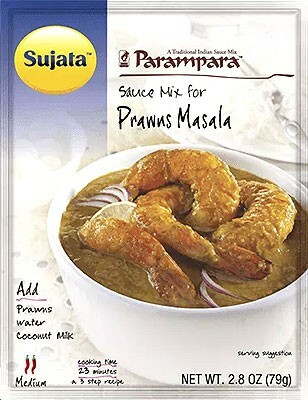 Prawn/Shrimp curry is easy to make with the contents of this pack, prawns/shrimp, water and coconut milk. This pack contains no artificial colors, flavors or preservatives. No hydrogenated fats, no preservatives or artificial colors and gluten free. Ingredients: dehydrated onions, sunflower oil, garlic, dehydrated tomato (tomato solids, maltodextrin), salt, ginger, spices, red chilli powder, sugar, BHA added to preserve freshness. May contain milk, cashew and coconut ingredients. Soak 7 oz. 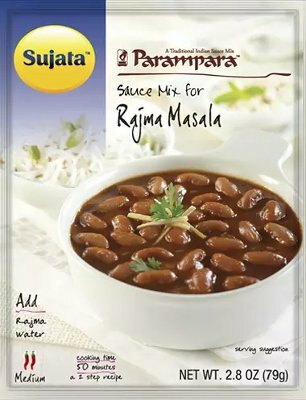 (200 g) rajma (Red Kidney Beans) in 34 fl. Oz. (1 ltr) water (to be soaked overnight). Drain the water and wash soaked rajma (red Kidney Beans) 2 to 3 times in running water. In a pressure cooker, cook soaked rajma (red Kidney Beans) with 34 fl. oz. (1 litre water) for 6 whistles. Allow the pressure cooker to cool for 10 minutes then open the cooker. Whisk entire contents of this packet with 10 fl oz (300 ml) water in a bowl to form a smooth mixture. Add this mixture to cooker containing boiled rajma, mix well and bring it to boil. Further cook on medium flame for 25-30 minutes without lid with occasional stirring. Suggested garnish with freshly chopped coriander. 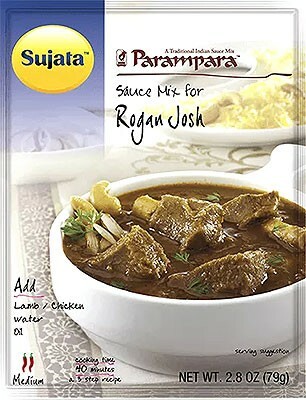 Brought to India by the Mughal Empire, Rogan Josh was adapted by Indians mostly in the Kashmir region of India. Onions and tomatoes tone down this fiery sounding culinary delight. This ready to use spice mix makes Chicken or Mutton Rogan Josh easy to make. Simply add the contents of this spice mix with chicken or mutton and add water and oil. This South Indian lentil based soup delicacy is a combination of local spices with a distinct taste of tamarind that tingles your taste buds. Cooking time only 25 minutes in only 2 steps! 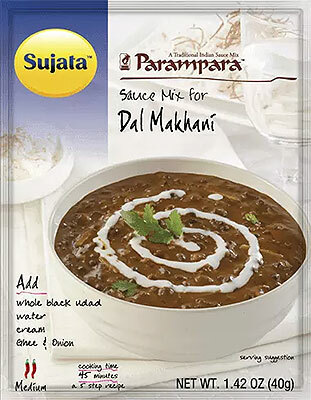 No need to add Dal; Just add vegetables and water! 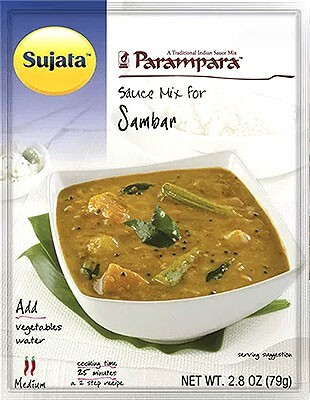 Ingredients: Ingredients: Tur Dal (Split pigeon Peas), Spices, Salt, Dehydrated Tamarind (Tamarind solids, maltodextrin), Chana Dal (split chickpeas), Sunflower Oil, Red Chilli Powder, Dehydrated Tomato (Tomato solids, maltodextrin), Sugar, Turmeric, Curry Leaves, Tartaric Acid, BHA added to preserve freshness. Shahi means "royal" and this preparation from Punjab is like royalty served on a plate. This rich and creamy cashew based gravy and its perfect blend of spices makes it a culinary delight. 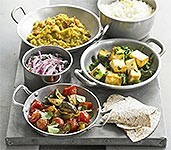 Just Add Paneer, Milk and Cream! Cooking time only 15 minutes! Fresh vegetables are flavored with herbs and spices and cooked along with aromatic basmati rice to prepare one of India's finest foods, the 'biryani.' 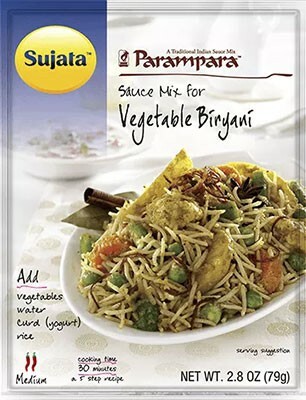 Flavorful biryani is ready when this spice mixture is mixed with fresh vegetables, water and basmati rice. Can be prepared on stove top or in pressure cooker.